Did I ever tell you about the time I did a raw food detox? It was nearly 10 years ago, but for 30 days I ate exclusively raw foods, including plenty of this salad. It’s the best detox salad EVER. During that time, I ate some variation of this salad for 30 days straight, along with plenty of fruit smoothies, raw fudge, and banana soft serve. To my surprise, I lost 17 pounds in a month. I wish I could say those results lasted forever, but when you take drastic measures and lose weight that quickly, it can also come back just as fast. In fact, short detoxes, cleanses, and diets like that are exactly why I struggled in a cycle of yo-yo dieting, binge eating, and body image issues for so long. I think I lost and regained the same 20 pounds for nearly a decade! If you can’t maintain a routine over the long term, or have to keep starting your diet over and over again, then it isn’t really “working” for you– even if you see amazing short term results. I knew there had to be a better way. Cabbage is loaded with vitamin C and sulphur, which help to remove free radicals and uric acid from the body. Raw carrots are thought to help balance your hormones by binding to and removing excess estrogen from the body, while also helping to remove bad bacteria from the gut. Avocado contains healthy fats which may protect the liver and help with better absorption of fat-soluble nutrients in the body. Fresh parsley is a powerful herb loaded with chlorophyll, antioxidants, and healing compounds that are thought to help increase urine flow and remove any harmful bacteria from the urinary tract. Ginger has anti-inflammatory properties and stimulates circulation and digestion, which may help to remove waste from the colon and liver. Raw honey is loaded with antioxidants, promotes restorative sleep, and may help to ward off infections and provide natural allergy relief. Lemons are thought to balance the pH of the body, detoxify the liver, promote skin repair boost the immune system, and strengthen the digestive system. When you throw all of these powerful ingredients into one detox salad, the results are delicious. I like to make a big batch of dressing and pre-chop the veggies at the beginning of the week, so preparing a healthy salad takes less than 5 minutes when I need something fast. You can even buy bags of pre-shredded cabbage and carrots to make this as easy as possible. I hope you’ll enjoy it as you gradually work on your health goals. 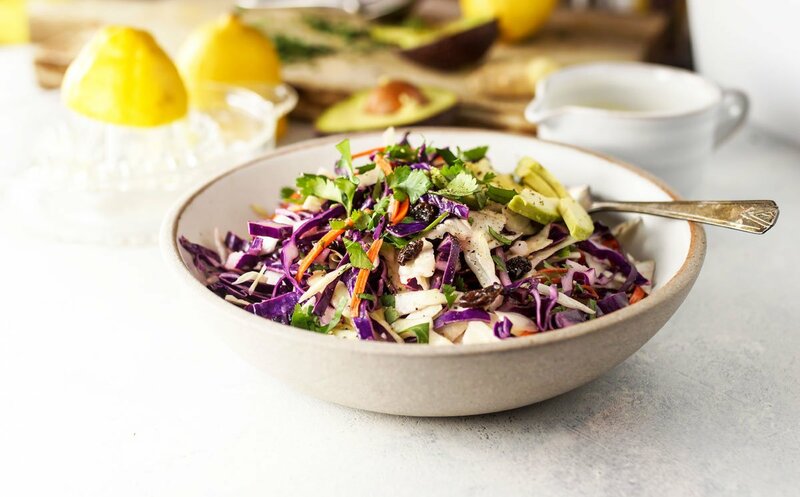 This detox salad typically serves one as a meal, but the dressing makes 1 1/2 cups so you’ll be able to serve it over many more salads during the week ahead. 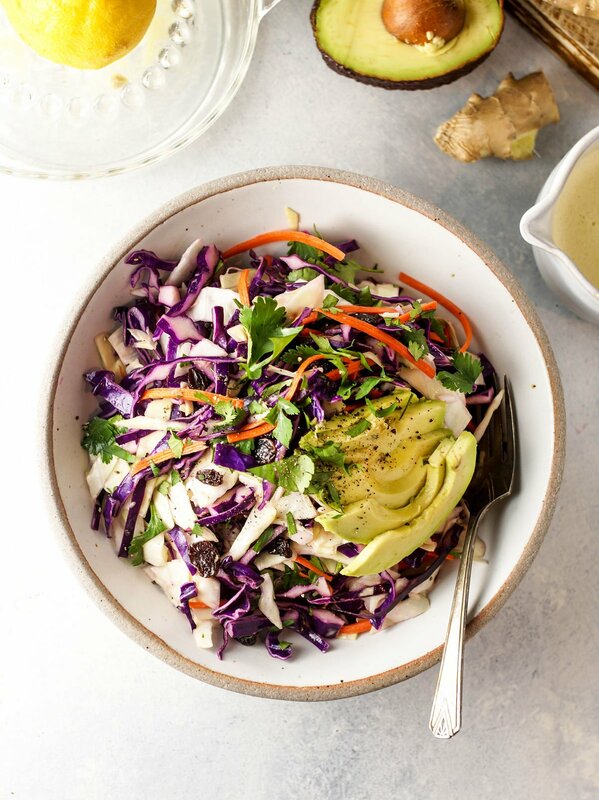 A nutrient-rich salad that is easy to throw together and naturally supports the body's detoxification system. To prepare the dressing, combine all of the ingredients in a blender, starting with just 1-inch of fresh ginger, and blend until smooth. Add more ginger to taste, if desired, and set aside. 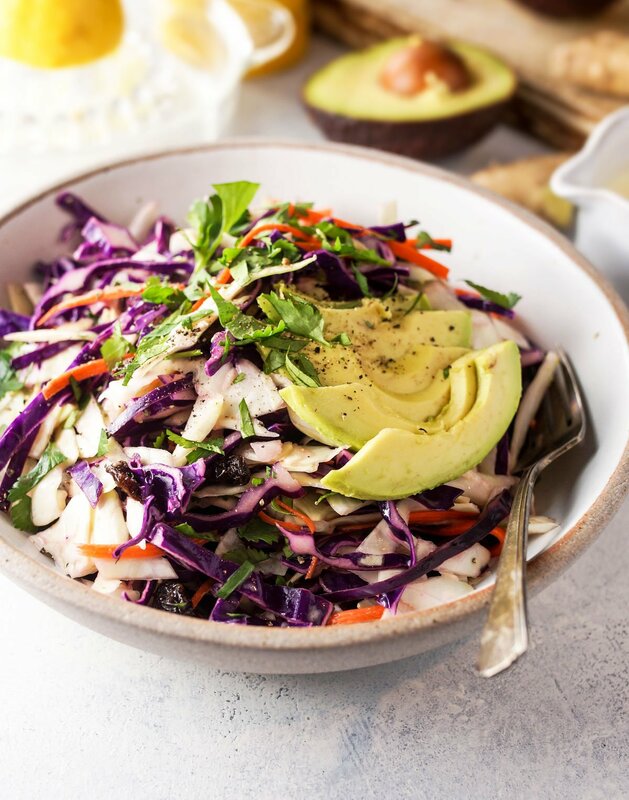 To prepare the salad, toss together the cabbage, carrots, and parsley in a large bowl and top with the sliced avocado and raisins. 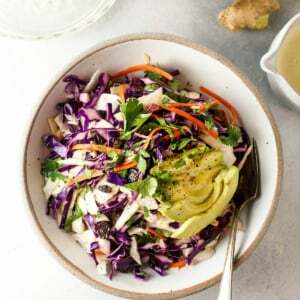 Top the assembled salad with 3 to 4 tablespoons of the lemon-ginger dressing and let it marinate for 5 to 10 minutes before serving. Store leftover dressing in an airtight container in the fridge for up to a week. As always, feel free to make substitutions as needed, and leave a comment below letting us know what works for you! If you need a vegan alternative to the honey, I’d recommend trying dates or pure maple syrup. Reader Feedback: Do you have any fun detox stories to share? I could probably write a novel on all of my detox-gone-wrong stories, but I’ll save those for another post! The combination of fresh ingredients is refreshing and so satisfying. Love it! This was so good! My 10 year old even liked it. We skipped the raisins though. Anything with that much avocado on it is a winner for me! This dressing goes with any salad! It was awesome! Is this really one serving? 😉 sounds huge! 4 cups cabbage and 1/2 avocado. Would that be a good lunch for weight loss? The serving size is totally up to you and your own appetite. I can sometimes eat 4 cups of cabbage and 1/2 an avocado in one sitting, but other times that might be too filling, so I’ll just stop when I’m full. The dressing recipes makes enough for several salads. I tried this salad. It was great! I’m going to use it as a side dish going forward. I like to toss in dried cranberries (no sugar added) in my red-cabbage/carrot salads. So yummie! Never tried a ginger dressing though but I’m going to try that for sure! One quick question: I’ve done a raw detox cleanse in the past and LOVED IT! All of the ingredients you have mentioned in this salad are spot on. The only curiosity I had was the olive oil in the salad dressing. I was instructed to stray on olive oil during the cleanse. Can you share your thoughts on that please? Thanks! I made this salad for the first time last night. It’s so good! I substituted dried cherries for raisins but I loved it. So quick and easy. I don’t feel guilty eating it even when I get home late from work! This will definitely be in my rotation of salads! Thank you. Even my picky husband loved it. He loved the sweet raisins and the creamy avocado. What a refreshing salad! Thank you for your consistently delicious recipes! That’s a lot of hard work. Bravo! I’m going on my third week in a row prepping this salad for the week! It’s become a staple in no time. I love how fresh it the lemon ginger dressing tastes. I brought it over for a dinner party and everyone loved as well 🙂 Thank you for sharing! Hi Megan! I’m an italian girl. Long story of PCOS well controlled, but lately I’m in insuline-resistance. It’s very difficult to not to gain weight or worst lose it. Sad. Looking for recipes and tips I’ve found your website, it’s amazing! I’m reading about grain free nutrition. What can I eat instead?quinoa? I’m a bit overwhelmed for all this situation. Thank you so mach for your great work! P.S. I’ve tried this recipe today, super yummy! It depends on how grain-free you want to be. Some people find that “pseudo grains” like quinoa and buckwheat work well for them, but others have to avoid them all together. I’d try a temporary elimination diet to see how your body feels when you reintroduce them. I just made this exactly as written and it’s seriously delicious! I made an enormous batch of this salad yesterday, adding organic red pepper, toasted almonds, and toasted sesame oil sprinkled as a garnish. I devoured it over the course of the whole day and woke up this morning feeling great and much more energized than I have lately. I think that the dressing is a bit too acidic as is, so next time I’ll use equal parts oil and lemon juice and I will be adding cilantro and lime for an Asian taste, plus, garbanzo beans for protein. I could eat this salad three times a week! It’s even good with kale or kale mixed with red cabbage! I find that with kale, though, I add the dressing and let it rest for an hour at least, adding the avocado just before serving. Sounds like a great recipe! I’m allergic to honey (clover and other varieties), so I stay away from it. Can I substitute organic maple syrup or stevia? We love this salad. 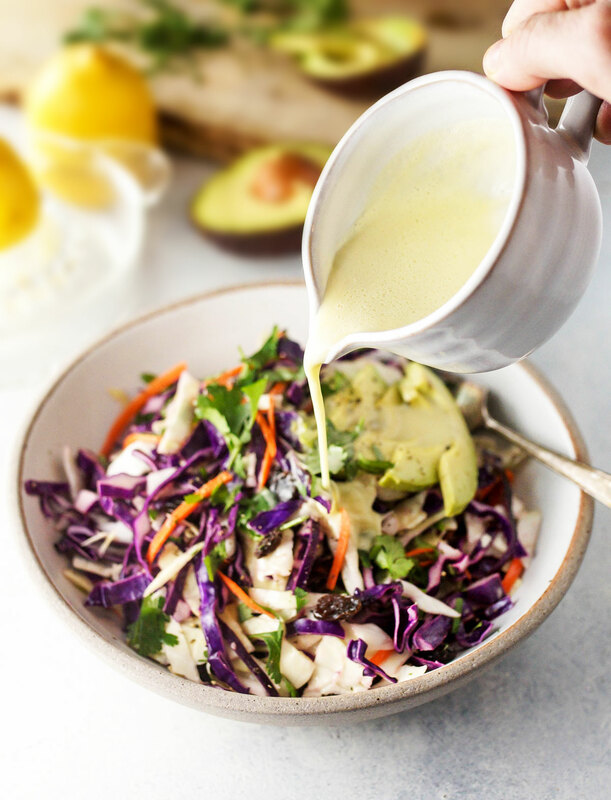 I throw it together all the time even without the dressing and we love the crunchy fresh combination of vegetables with the subtle sweetness from the raisins! Made this salad tonight – followed your recipe to a T except for the parsley – none on hand. The salad was absolutely delightful; just the right amount of sweetness with the honey and raisins. Can’t wait to have it again tomorrow! This is a wonderful salad. I didn’t have ginger for the dressing on hand, so I made your balsamic honey dressing. Fabulous. I haven’t tried it yet but I’m sure I will. Did you use regular raisins? I love raisins but they do have sugar in them which I try to avoid if I’m going to detox. I can’t seem to find raisins with no sugar. I used unsweetened raisins. They are so naturally sweet as it is, there’s no need for added sugar! I love purple cabbage! Purple cabbage, pears, pecans and homemade mustard dressing make a delicious combo for salad! This looks beautiful. I think I might add shaved Brussels sprouts as well. Thank you. After a month of too much sugar, I am craving raw foods and salads! This detox salad looks so flavorful and refreshing! Question…could I use dried parsley and how much if yes. I’m not crazy for the taste of fresh parsley . Weird I know! Fresh parsley is definitely an acquired taste! I’m not sure if the health benefits are exactly the same with the dried version, but you could probably add 1/2 teaspoon of the dried stuff to this salad, if you’d like to. For the fresh ginger, I actually just throw a peeled chunk into my blender and let it do all of the work! I made this salad but used cilantro instead of the parsley and it was delicious! Can’t wait to try this amazing salad and dressing. Everything in it is amazing alone and putting them together should be ever better!! Thanx.